This Naja pendant is formed with a heavy-gauge piece of hammered ingot triangle wire that flattens towards the opening of the horseshoe shape where it's decorated with a series of round graduated appliquées . 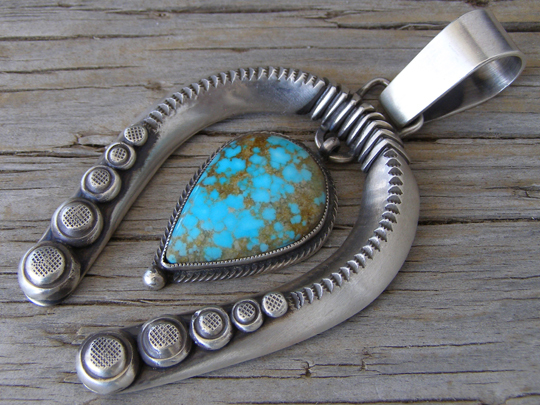 A free-swinging teardrop of natural, untreated Turquoise Mountain turquoise hangs in the center of the pendant. The large bale on this will accommodate Erma Arviso's antiqued Sterling beads up to 10 mm. diameter. Wonderful, heavy traditional work!